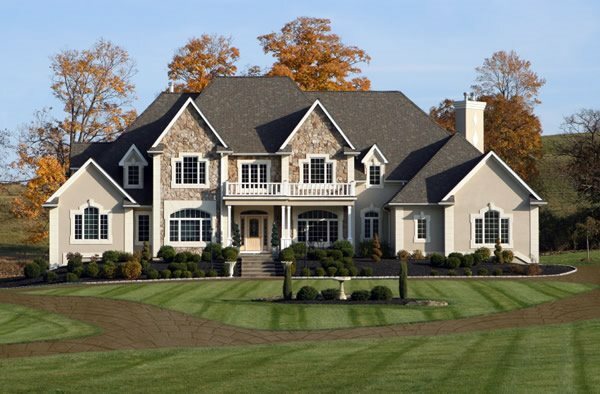 The curb appeal of your home is significantly impacted by the quality of your home exterior. Many builders today scrimp and save on exterior design by producing homes with little or no character. Generous overhangs and exterior mouldings which help contribute character to a home seem to be left out of newer designs. 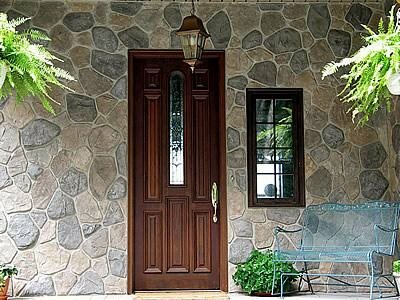 Both subtle details such as architectural elements above doors or windows to more noticeable characteristics such as a patterned and colored driveway or walkway, are the types of features that make a home unique and appealing. Here are six ways to use concrete on your home exterior: architectural accents, entryways, exterior siding, walkways, driveways, and landscaping. Driveways are a staple item of nearly every home. The driveway is one of the most notable parts of your home's exterior, and it can have dramatic impact on your home's design. 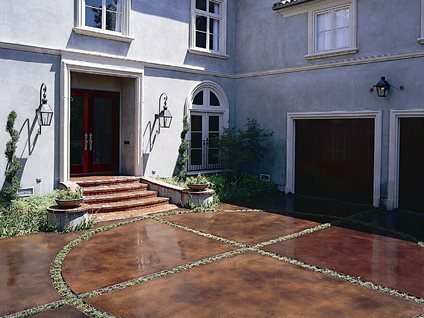 Because the majority of driveways are made of concrete, it makes them easiest to install decorative applications. If you're building a new home, then adding color or texture to your driveway to complement your home is easy to do and not as costly as you might think. If your driveway is already existing, there are numerous ways to add color and even patterns and texture with technologies in concrete overlayments and resurfacing. Common questions about decorative driveways | Which decorative style is right for your home? More than just a way to get wherever it is you're going, walkways around a home guide and welcome visitors. 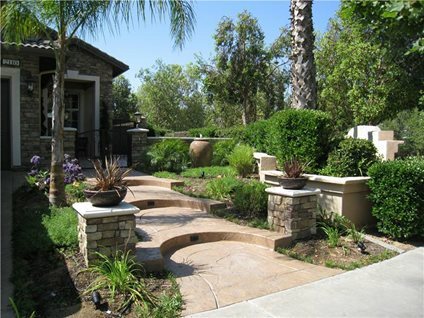 Leaving your home's walkways plain and purely utilitarian detracts from your home's exterior appeal. 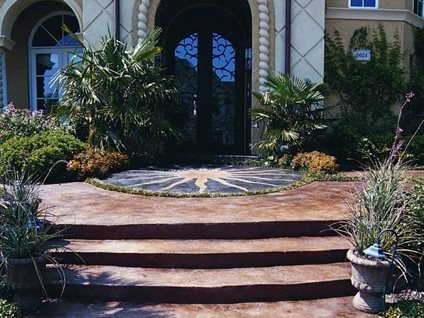 The concrete industry has rapidly developed many decorative products that can be applied to both new and existing walks and sidewalks. The entryway to your home should welcome guests with open arms. The best feature of an appealing entryway is a wide opening suitable to accommodate at least 2-3 people. Raised entrances with a simple flight of steps lift guests and through the use of stamped or stenciled patterns, engraving, coloring and staining, your entryway will look as appealing as it feels when guests approach. Giving attention to adding unique features or architectural details can transform a home from plain to personalized. Using architectural precast concrete is the perfect medium for producing decorative columns, balustrades, arches, and more. The exterior façade of your home can be as plain as stucco, or as custom as stacked stone. What many people fail to realize is that concrete can create the look of either (plus a multitude of other designs) at a fraction of the cost of installing real stone . Your home doesn't have to be boring. Products and techniques using concrete stamping mixes and tools give you a wealth of options. No home is complete without some greenery or plantings to soften the edges of hardscapes. While landscaping can go from simple to elaborate quite easily, there are a few guidelines to follow for having a well-balanced look.